One of the types of visuals that I review in my workshops is the Venn diagram. These diagrams were created in 1881 by John Venn as a way to represent relationships in the branch of mathematics known as set theory. The basic Venn diagram used in presentations shows two partially overlapping shapes, usually circles or ovals, and text to show what belongs to only one shape and what is common to both shapes. Here is an example I show in my workshops. Why might you want to use it in your presentation? Here are two situations where it helps clearly explain your point. The first is when you are trying to show an overlapping relationship. It could be amongst roles, departments or product features. The key message is to show how some elements of each individual role/department/product are unique and some are the same as the other role/department/product. The Venn diagram makes these distinctions visually clear for your audience. A second situation is when you are showing the intersection of ideas. A common example right now is to show one circle that represents efficiency and profitability and the other circle represents environmental responsibility. There are elements that are unique to each, but the intersection is where many organizations are trying to position themselves so that they can meet their objectives in a way that also contributes to the health of the environment. A Venn diagram is one of the built-in diagrams in PowerPoint, but I find it usually better to create my own using shapes and text. By creating my own, I dictate the size and position of each shape, the degree of overlap and where the explanatory text goes. By creating each element on its own, I also enable the ability to animate each element so when I show the diagram, I can explain each element individually. Some tips when creating Venn diagrams from my experience: build the diagram in the order you want it to appear so the overlapping looks the way you want it to; use semi-transparent shapes so that the audience sees the overlap clearly; use text boxes instead of adding text to the shapes to give yourself more flexibility; and build the diagram using animation so you can explain each element properly. If you haven't used a Venn diagram to show an overlapping or intersecting relationship, I suggest you sketch it out and see how it can be helpful. If you need some more detailed instruction on how to create a Venn diagram in PowerPoint, check out the videos at http://www.ThinkOutsideTheSlide.com/ppthowtovideos.htm#venn . Maybe an example of a Venn diagram would make things easier for those who do not know what a Venn diagram means ;-) ! Good idea! I'v enow added an example in the post. 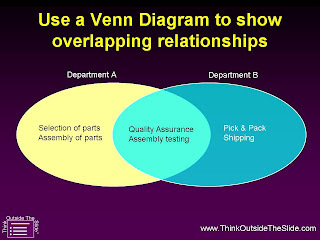 Great (and funny) examples of Ven Diagrams and other relational graphics can be found at http://indexed.blogspot.com . Jessica Hagy makes me smile every day.